What a difference dry wall makes! Some of our guys, Mike Poirier and Randy McCarver, started hanging the sheet rock. They were joined by a great group of folks from churches of the Mid-Lakes Baptist Association in Missouri. The following week another great team from Lake Shore Baptist of Massachusetts continued where they left off. 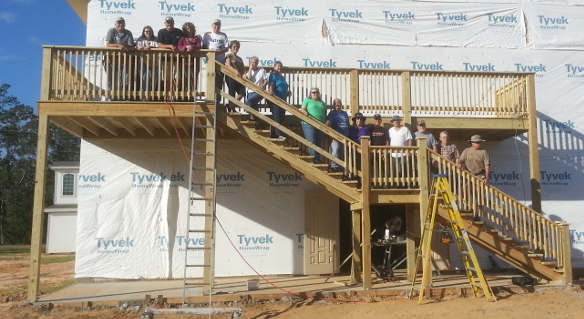 This week Mississippians from Dumas Baptist Church finished the job. It is a happy new year indeed. 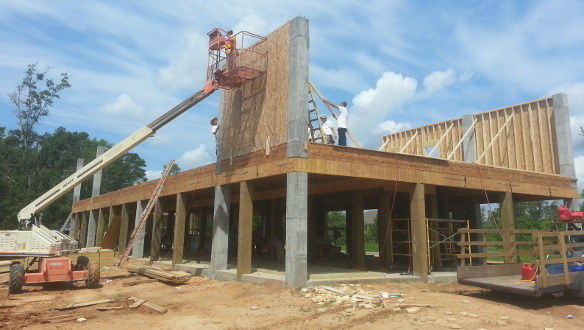 Progress moves forward on the new church building and fund raising efforts look good. This time last year the corner of Lakeshore Road and Second Street sat as an empty field with nothing more than stakes in the ground run with string. 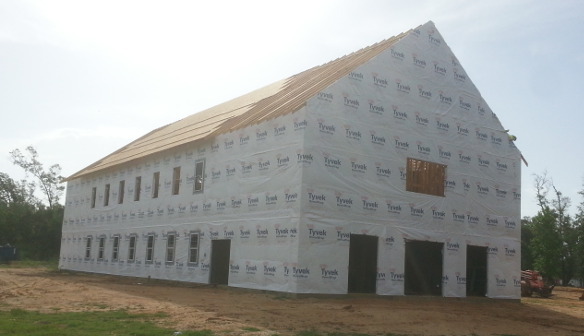 Today the edifice of a new building stands tall, waiting completion, for the glory of God. Over the past twelve months we saw pilings pounded into the ground, footers dug, pillars set, the slab poured, the floor joists hung, the walls built, the trusses swung into place, the roof shingled, windows and doors installed, a back deck constructed, the building wired, the plumbing run, and a thousand other things. For those closely following the progress, you know we were “dreaming of a white Christmas” with the hope of spray foam insulation last week. Before we broke for the holiday we decided to juggle priorities and hold off on that application for a few weeks. This change does not jeopardize the schedule in any way. It simply gave us some breathing room to ensure that all the rough in electrical, plumbing, and HV/AC could receive the attention it deserves. As we look forward to 2014, we see the promise of a completed project by summers end. In a few days, 100+ volunteers will flood into Lakeshore for an intense week of loving labor. 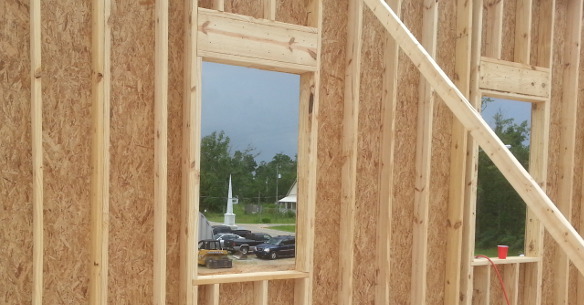 Plans include constructing the front entrance, setting the massive front columns, starting the siding, and preparing for the elevator, among other things. 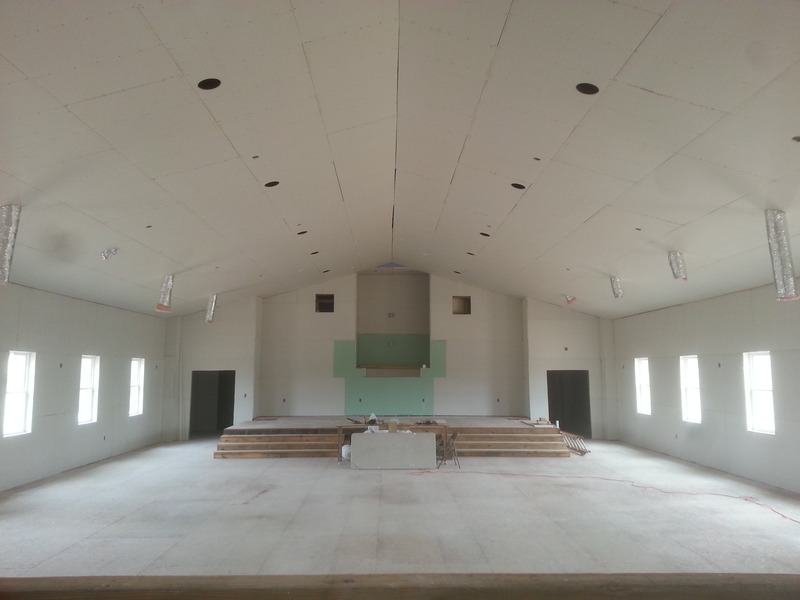 Lord willing we will begin hanging sheet rock in February. 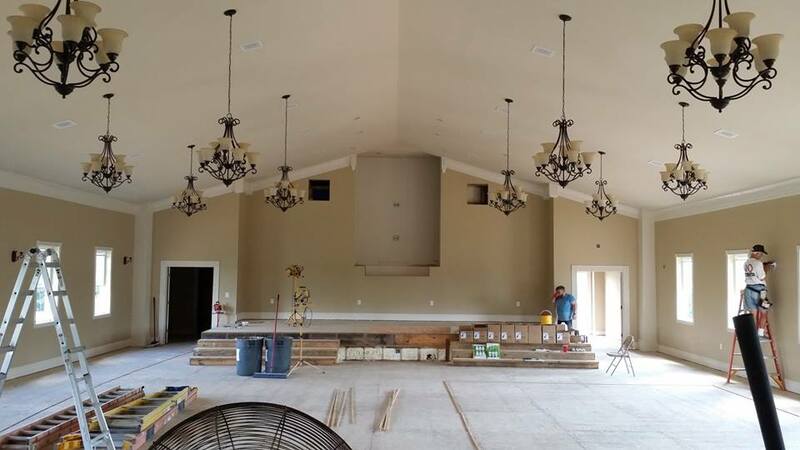 Come March, we will need some more hands to move forward with paint, flooring, trim, restrooms, and the punch list that will be several pages long on a project this size. Its not too early to plan a Spring Break mission trip. Would you like to come? Contact us for details. 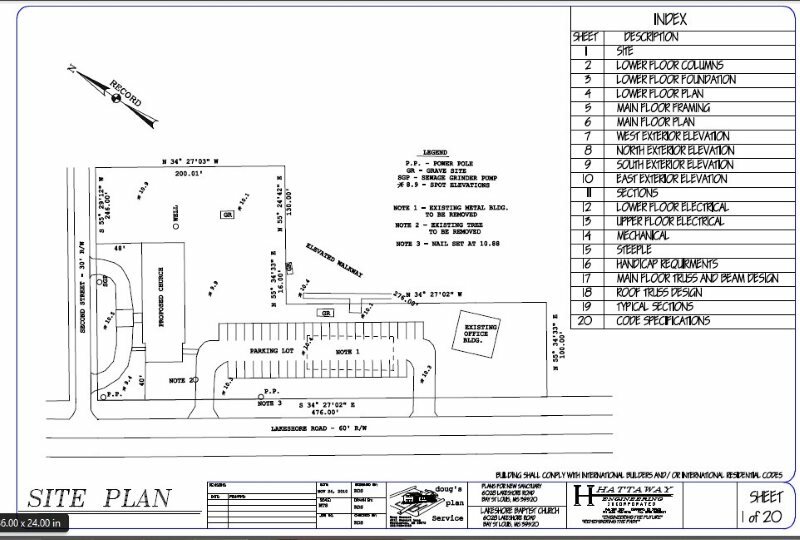 I would like to also ask you to join us in prayer concerning our financial goals for the project. 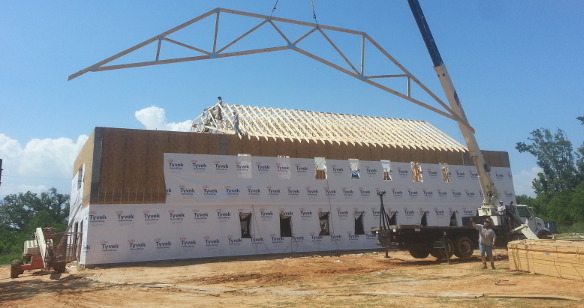 We need an additional $37,000 to complete the building. For a church our size, that is still a substantial sum, but I do not believe it is insurmountable. The LORD owns the cattle on a thousand hills… His cattle, His house, His glory! Author Pastor Don A. Elbourne Jr.Posted on January 1, 2014 Categories New Church Buildings1 Comment on Happy New Year! 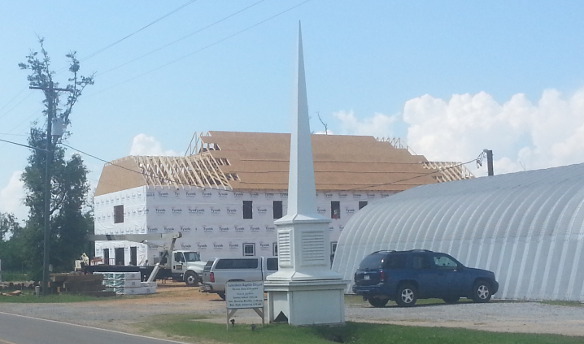 The month of June 2013 saw great progress on the new Lakeshore Baptist Church building. Hard working volunteers from Louisiana, Mississippi, Texas, Alabama, Kentucky, Florida, South Carolina, Tennessee, Georgia, and Maryland worked together for the glory of God. The main shell of the building nears completion. 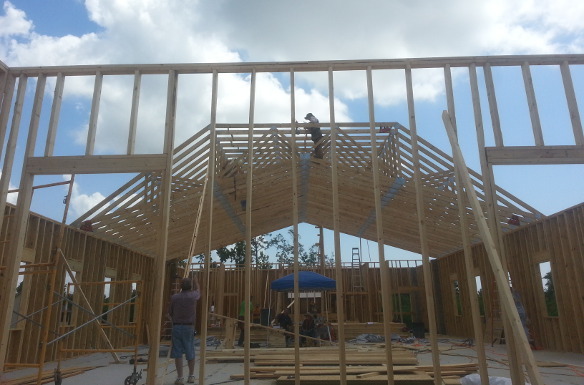 Lord willing, in coming weeks we will finish the roof and have the structure dried in. God gave us a beautiful week. 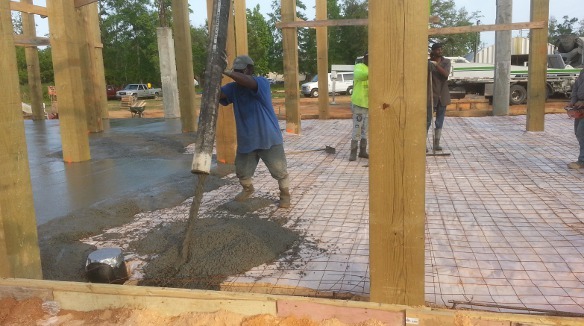 Through the hard work of folks from FBC Zachary, LA and FBC Ponchatoula, LA, we made great progress on the church building foundation. The great weather gave the team an opportunity to frame and pour the next stage of the concrete pilings, form up for the slab, set all the rebar, and dress up the site. 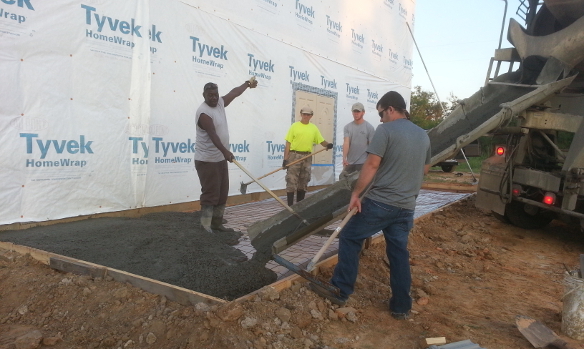 We did the big pour late yesterday afternoon. Under the lights last night a crew finished the slab. We still need to set and pour the last stage of the concrete pilings, cut in the wood pilings and set the floor beams, but this work literally lays the groundwork for the framing crews schedule to be with us in June.